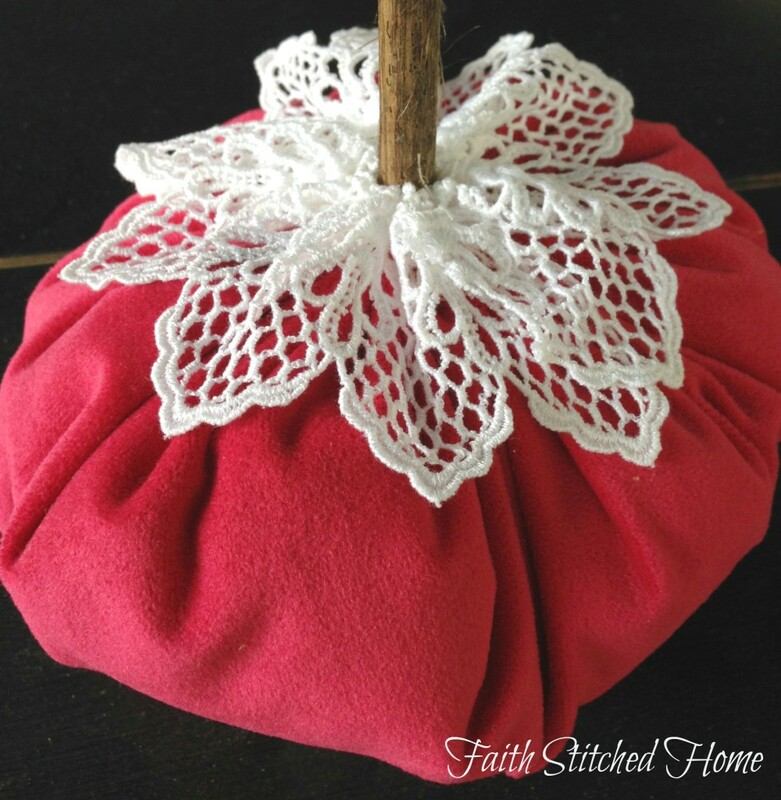 Although this has nothing to do with my topic of the month, “(Re)Purposed Sewing”, I couldn’t close out the month of October without sharing some holiday related images. Last year I stopped in a great antiques market just to stroll through and soak up some inspiration. Enjoy! 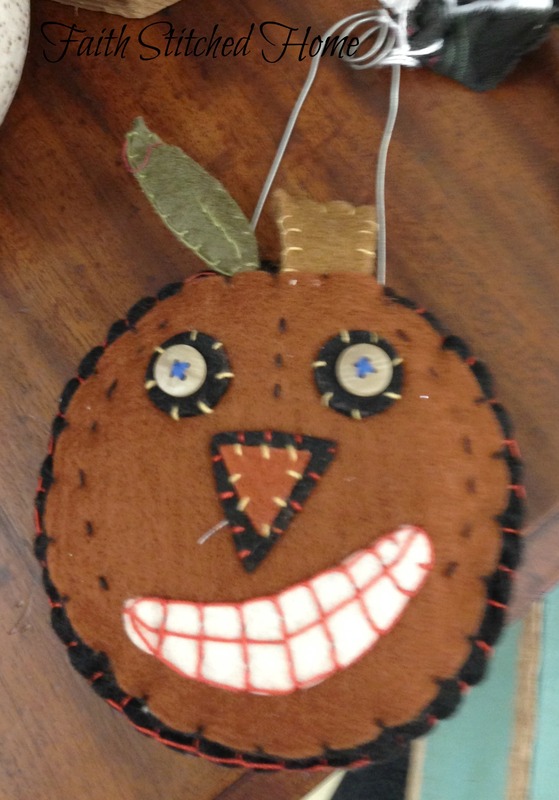 Well, did you guess at the material I used to create this version of patchwork pumpkin? Yes, fabric swatches started it all. Back at it today with a different type of pumpkin – the one that started this whole addiction of mine. Put your thinking caps on and guess what I (re)purposed to make this little beauty. Even though I have finished the (re)purposed projects with the vintage quilt [at least for now], I have a few more items to show you that involve reusing fabric for purposes that was not originally intended. A co-worker was moving and cleaning out to lighten the load for the cross country move. A friend of his, who worked for a national furniture chain, had passed along upholstery samples for which I became the lucky recipient. 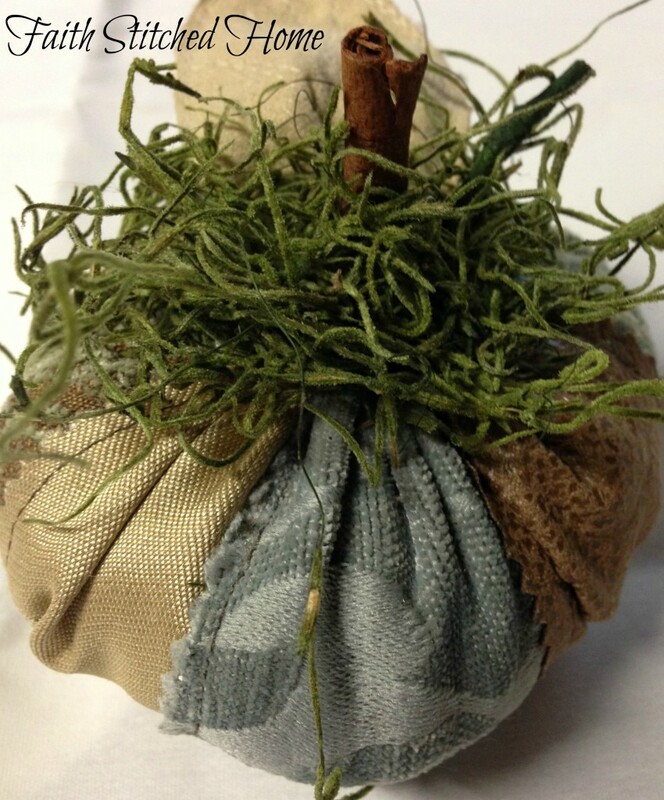 What, you ask, to do with fabric samples? Well that’s a silly question; you know me better than that! Make pumpkins of course! Don’t you just love this little pink chenille number? She’s cute and prissy with that lace collar. She looks so much like those velvet pumpkins that are so trendy right now. The lace comes from my friend’s mother’s sewing stash. I love it! 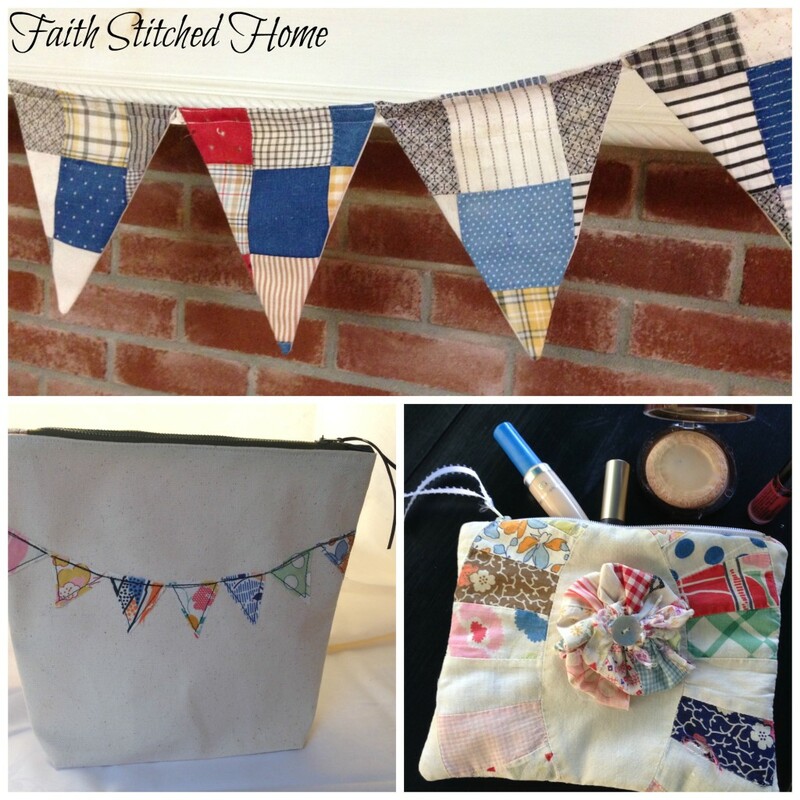 Enjoy this collection of all the projects I created from the vintage quilt. 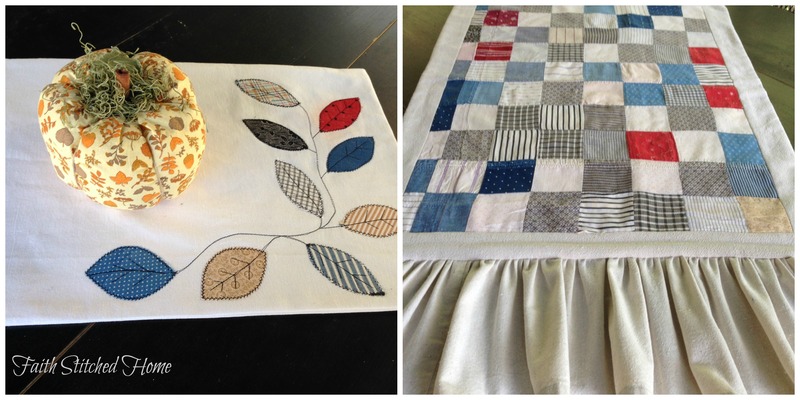 I hope you will be inspired to (re)purpose an old, well loved but unusable family quilt into useful, new items. This project is the last I had planned for my (re)purpose vintage quilt series. I had a few small projects that I just didn’t have time to get to. 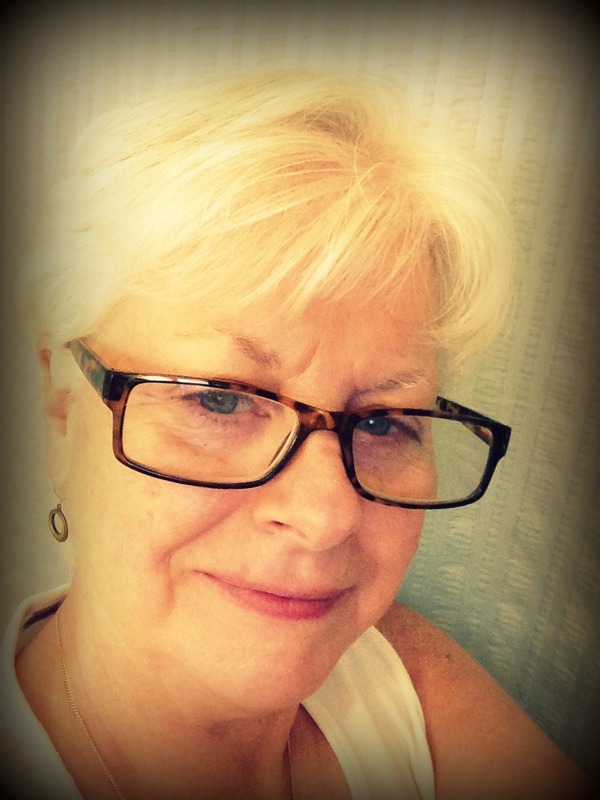 Most of my sewing takes place on the weekend as does laundry, house cleaning, grocery shopping, etc. Therefore all the planned projects on my list had to be completed this weekend since next Saturday is the last day of the Write 31 Days challenge. Due to the above list of must-dos, today’s project is the last one of the quilt (re)purpose that I have to showcase. 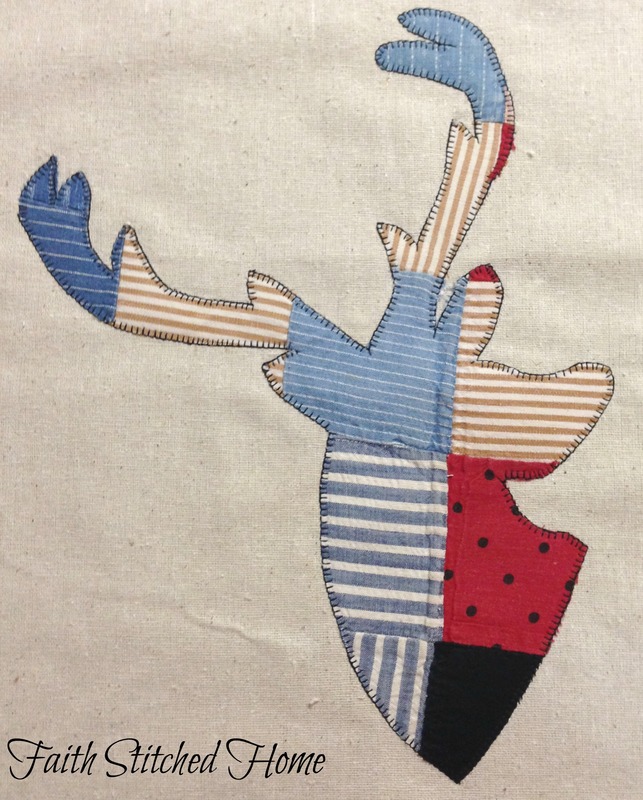 Much like the state of Georgia applique that I made for the pillow cover, I free-hand sketched a deer head (very trendy these days), and traced it onto a piece of the patchwork vintage quilt to which I had ironed some interfacing on the back. I cut it out and set my machine to the blanket stitch and stitched it to a piece of leftover osnaburg fabric. Halloween is this week and you know what that means – Christmas is just around the corner! I have already started seeing Christmas items in stores for at least the last two weeks. Hence the inspiration for today’s (re)purpose project from the vintage quilt. 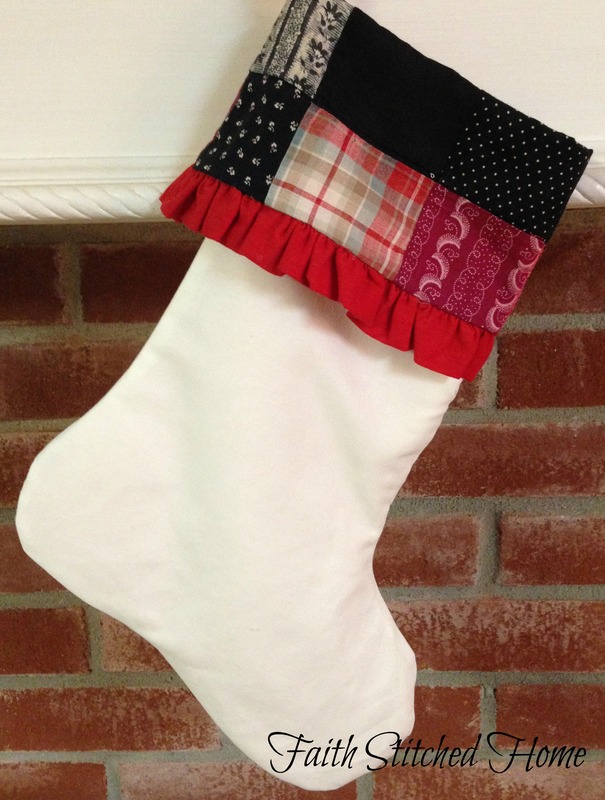 The body of the stocking is made from leftover curtain lining. I would have preferred to use drop cloth because it is more folksy like the patchwork but I used all that up with the other projects. This project is in the same vein as the patchwork teddy bear. 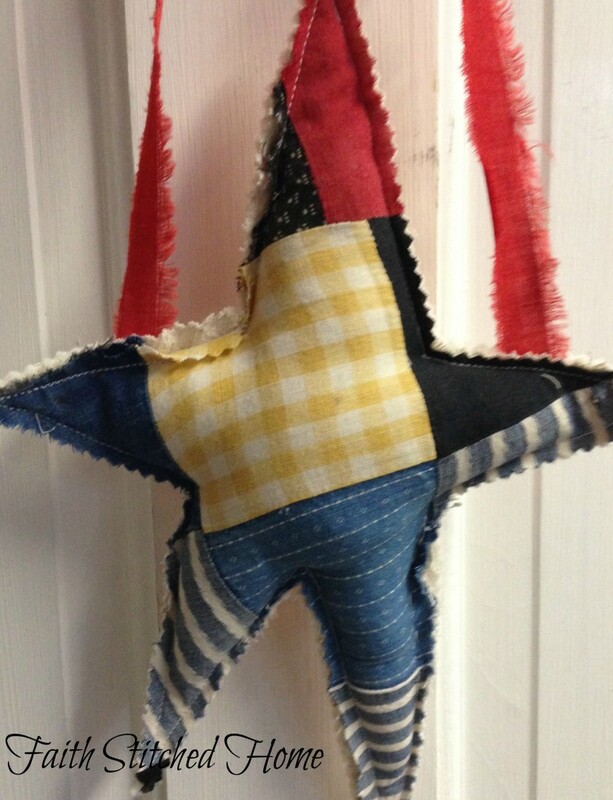 Just a simple primitive star shape that is stuffed and finished with a raw edge. A torn strip of the binding was used as the hanger. At my friend, Connie’s request, here is a quick and easy how to for the patchwork pumpkin. I’ve got to warn you right now before I go any further: This project is addictive. You will not stop at just one. Heck, you might not stop at ten! Please do not hold me accountable should pumpkin making consume you and cause you to skip cooking dinner or doing the laundry. Blame Connie for asking! Create these at your own risk. Oh, and enjoy yourself during the process! It’s a brilliant fall morning; the sun is shining and the air is crisp. A perfect morning for having coffee on the screen porch. 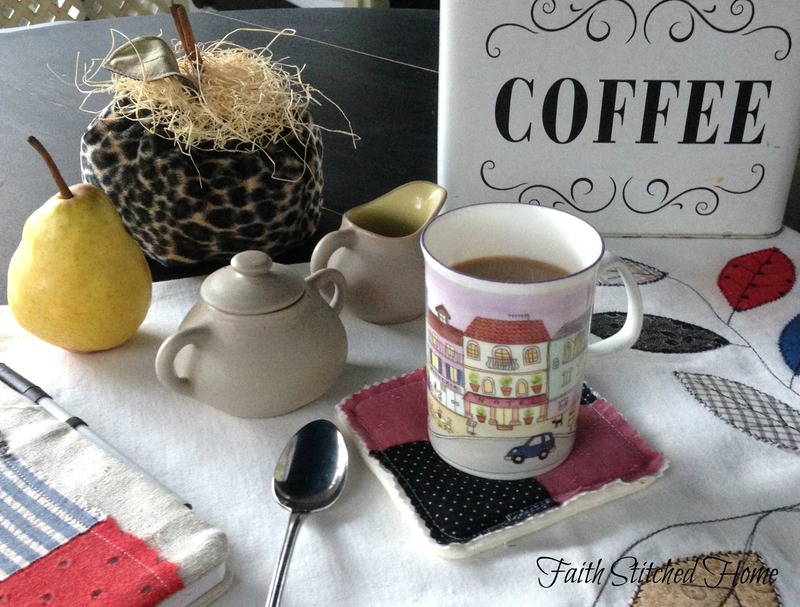 I used some of the vintage quilt scraps to make a coaster like the one under my cup this morning. Only a small scrap is required for each coaster. Hi! 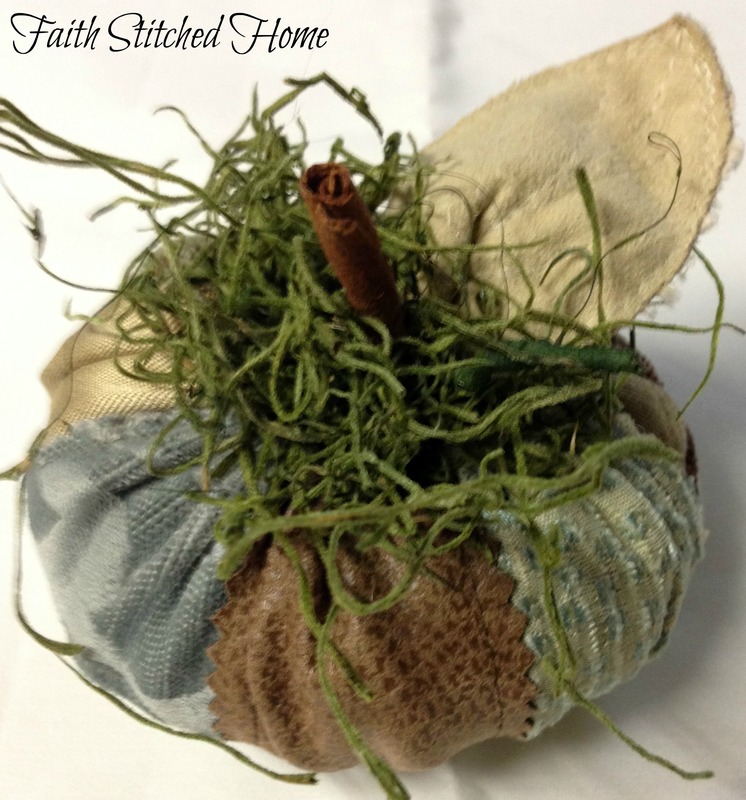 Welcome to Faith Stitched Home! 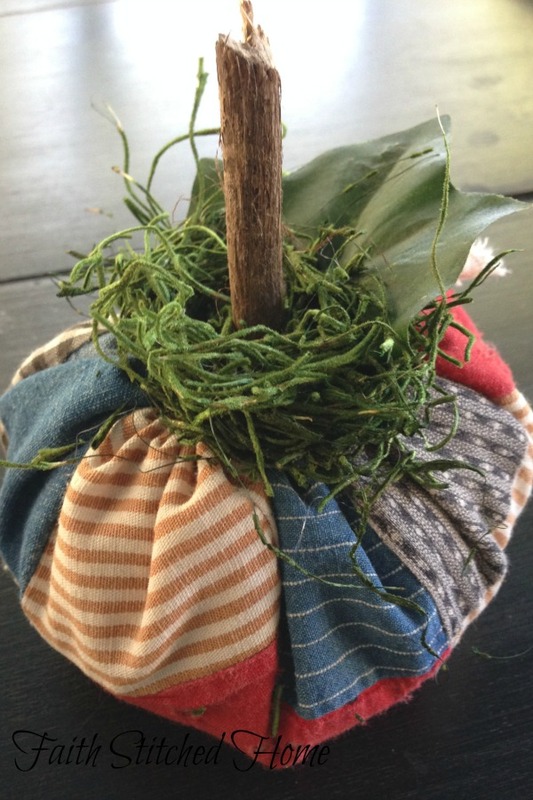 Let's sew, quilt, craft, cook, dig in the garden, and make our house a home. How about a glass of sweet iced tea while we ponder life and celebrate our blessings? This is an example of a text widget which can be used to describe a particular service. You can also use widgets such as recent posts, latest tweets, a tag cloud or more.